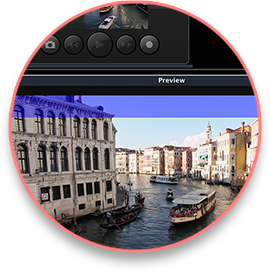 ScopeBox gives you a high quality, highly flexible preview monitor. You get all the settings you'd expect to find on a high-end field monitor, plus some software-only extras like focus assist and zebras. Add framing guides and overlays to make sure that your shot works out exactly the way you expect. 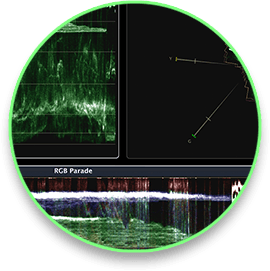 You get all of your "old favorites" - waveform and vectorscope - plus some new ways of visualizing your signal like the RGB histogram or Channel Plot. You can mix and match scopes, save layouts, and be confident that you're seeing every pixel and every frame of your signal. Record everything from DV to 4K, in either its native format or in a variety of edit-friendly post production codecs. Fail-Safe Capture means you don't have to worry about hardware or software failures interrupting a capture; you'll always be left with a valid, playable file. ScopeLink allows you to feed video directly from many popular applications directly to ScopeBox. 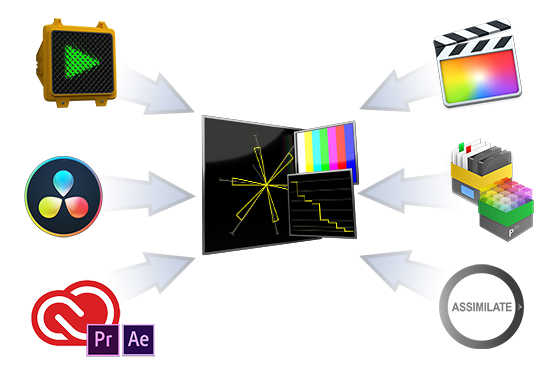 Whether you're working in editing and compositing applications like Premiere Pro, Final Cut Pro X, or After Effects; DIT tools like Prelude, Silverstack, or LiveGrade; or color grading software like SpeedGrade; you can use the same professional scopes. Turn your older Mac Mini into a dedicated scope system, or take your scopes on the go with a Macbook, Macbook Air, or Macbook Pro. By leveraging the Mac you've already got, you can have scopes in any environment. 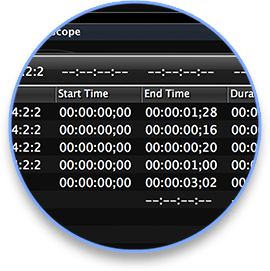 ScopeBox doesn't limit the frame size you can monitor. From SD to 4K, if you can feed the signal into your Mac, ScopeBox will monitor it. Scopes can be used far more accurately when they work in the same format as the rest of your production pipeline. Whether you're in YCbCr or RGB, 8 bit or 10bit, 4:2:2 or 4:4:4, ScopeBox will display your image perfectly. With the ability to save layouts and source settings, you can easily create a "turnkey" scope station, which launches directly into your preferred configuration. When combined with an inexpensive Thunderbolt capture device, ScopeBox turns your Mac laptop into the ultimate portable quality analysis solution.